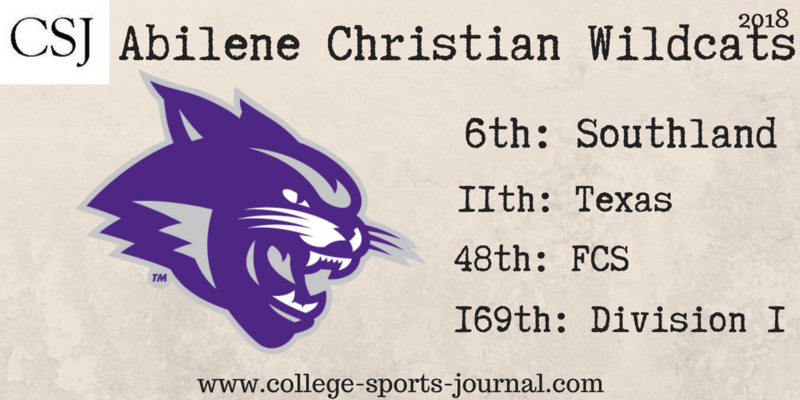 2017 In A Sentence: In the final game of the season, the injury-plagued Wildcats had to resort to a 3rd string QB to face Central Arkansas, which was a microcosm of ACU’s injury-plagued 2-9 season (a game which they lost 34-0). Biggest Shoes to Fill: LB Sam Denmark (90 tackles, 6 tackles for loss) was one of the Wildcats’ best defenders last year. Key Player: It’s been a couple years of tumult for head coach Adam Dorrel as there’s been a lot of roster turnover, but going into this season he’s confident he has a bunch of players that share his vision. A big boost for the Wildcats is the return of WR D.J. Fuller, who sat out 2017 for academic reasons but was a key contributor in 2016. His presence will give the offense a desperately-needed boost. Fearless Prediction: With some new transfers on the roster and Fuller returning, the Wildcats will be better this season. In the Southland that means some conference wins and flirting with a .500 record, but asking ACU to compete with the top teams of the conference is too much to ask.